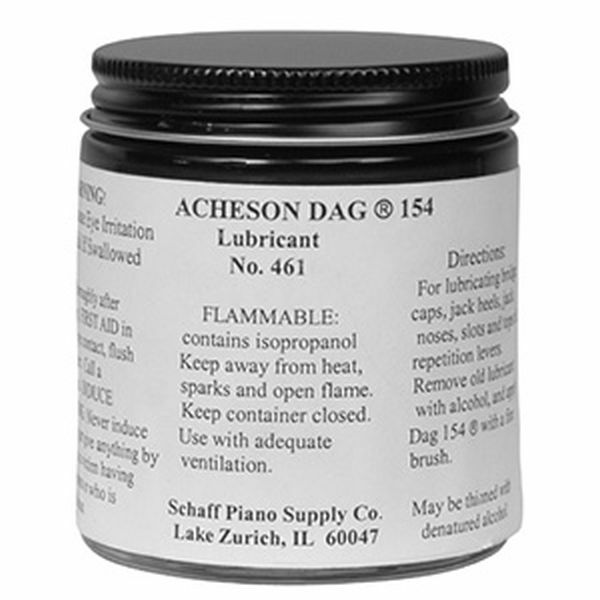 Acheson Dag ® 154 Graphite Lubricant - 4oz jar. Can be applied with a fine brush to bridge caps, jack heels and noses, slots and tops of repetition levers, pedals and all types of action springs. This long lasting graphite dries rapidly . This product is not available to ship by Air or outside the USA. Fixed a pedal sqeak in a few seconds. This size container should last for quite a while - I have other uses for graphite, too. It's good to keep this around. Thank you for your quality service to me as a customer.